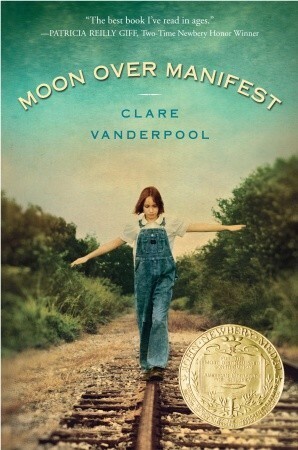 Moon Over Manifest surprised many people when it came out of left field and won the Newbery Medal. I hadn't even heard of it until then, let alone predicted that it would win anything, so naturally I was quite curious and immediately got my hands on a copy of the book. Having finished it, I can say I definitely approve of the Newbery committee's decision, even if I'm not quite sure if I know any kids who will willingly read this book. Moon Over Manifest is the story of 12-year-old Abilene Tucker, who has come to Manifest, Kansas to live with Pastor Shady Howard while her father, Gideon, Shady's friend from a long time ago, works a railroad job back in Iowa. She's not sure why her father has suddenly decided she can't tag along on his jobs, but Abilene is confident Gideon will return at the end of Summer 1936, and she does what she can to make herself at home. With new friends Lettie and Ruthanne, Abilene uncovers letters and artifacts left behind by someone named Jinx, and learns that there may have been a spy amongst the people of Manifest back in 1918. The ensuing spy hunt, which goes on all summer long, introduces Abilene to many of the townspeople in Manifest, and begins uncovering some sad secrets people have been sitting on for close to 20 years. Most notable and interesting are the stories Miss Sadie, a self-proclaimed "diviner" tells about Jinx and his friend Ned, and what her stories ultimately reveal about the town's past, and Abilene's own past. I think the fact that I had a difficult time writing a summary of this book is actually a compliment to its complexity. While I was reading the story, I was never lost in its many threads, but trying to articulate those threads myself is nearly impossible. The simplicity and clarity of this novel is actually pretty remarkable, and the longer I think about the book, the more impressed I become. Clare Vanderpool does an especially good job of transitioning between the present-day scenes set in 1936 and Miss Sadie's narration of the events of 1918. She also managed to keep me in suspense far longer than children's books usually do, and when I finally learned what the ultimate truth of the story was, I felt it so strongly, I then went to sleep and had a dream about living in Manifest. It's not every day that a book becomes so real for me that I attempt to live in it. Saying too much about the plot, and what impressed me about the book would spoil the surprises, I think, so I want to be careful. I can say, though, that Abilene is a refreshing voice, the townspeople of both time periods are wonderfully well-done and manage to represent the varying cultures living in Manifest without becoming a series of bad ethnic caricatures, and the ending has such a wonderful emotional payoff, I can't even put into words how much I loved it. I often sing the praises of award-winning books, but this one, in particular, just got its hooks into me, and didn't let go. Still hasn't. I hope there are kids who will pick up Moon Over Manifest. It might be a hard sell because it's slow to start, and I think a lot of the subject matter might sound dry and unfamiliar to elementary school kids. But I thoroughly enjoyed it, and the experience of reading it, without preconceptions or even any hints at what's to come, is really valuable. I'll be thinking about this book for a good long while.